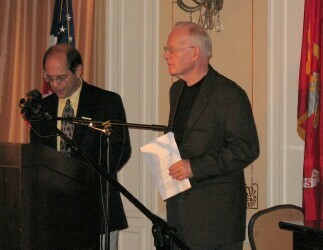 I recorded this interview in San Francisco at the Marine’s Memorial Club and Hotel on February 19, 2010. The occasion was the Architects and Engineers for 9-11 Truth press conference announcing the group had surpassed 1000 signatures from licensed building professionals calling for a new investigation into the destruction of the three World Trade Center buildings. Griffin was a keynote speaker. “Then, more generally, loss of reputation. The effectiveness of this term ‘conspiracy theory,’ ‘conspiracy theorist’ and that no member of the press can be a conspiracy theorist because they’re supposed to be objective, even if objective means parroting everything the government says. In our day that’s what counts for objective. This entry was posted in 911, News media and tagged AE911Truth, Building 7, censorship, David Ray Griffin, media resistance to 9-11, Project Censored by Shawn Hamilton. Bookmark the permalink.